You will find inspiration in the Lot. 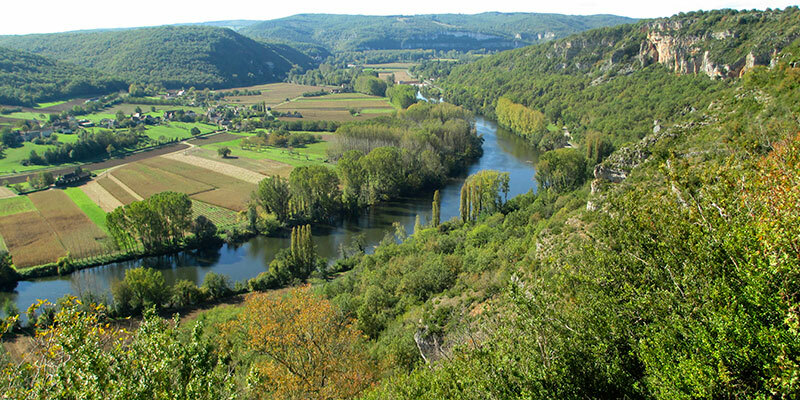 It is a rugged, wild & unspoilt landscape, named after the next river south of the Dordogne. Off the beaten path. 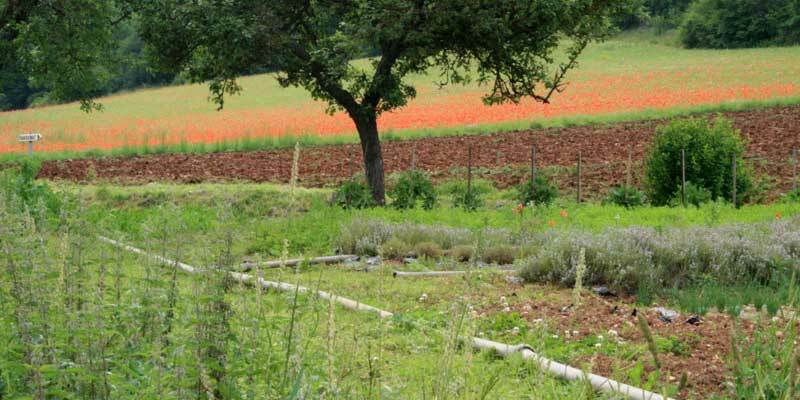 ‘La France Profonde’, where small scale farming still exists alongside ‘Le Parc Naturel des Causses de Quercy’, a protection zone of some the most beautiful nature in the South West. 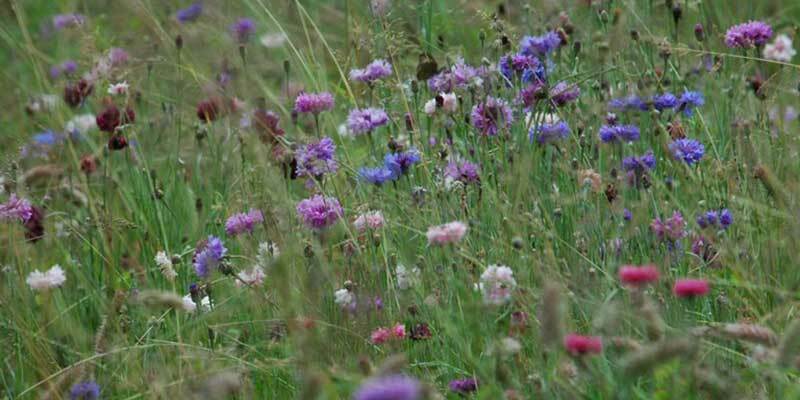 There are many unspoilt little fields with copious quantities of wildflowers. It’s a stony, limestone country. Old dolmens lie along shepherds ancient pathways. You can walk for days along the footpaths (we can supply you with maps). 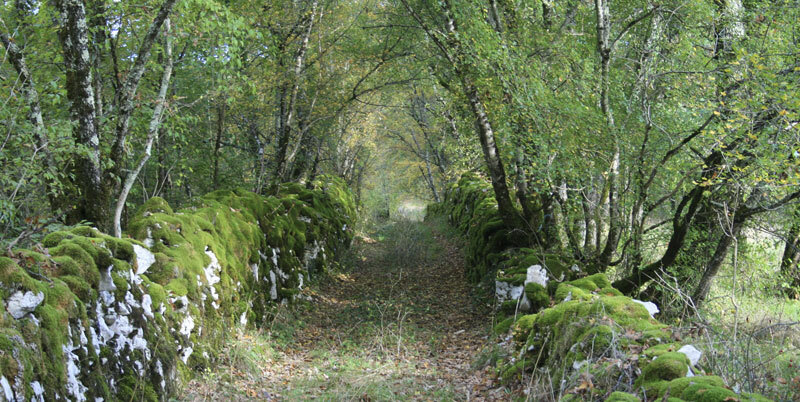 Dry stonewalls, scrub oak & sheep farming on the plateaus. Tobacco, maize, vines, walnuts & poplar-lined rivers meandering through the valleys. Romanesque Churches & their villages perched on cliff tops. 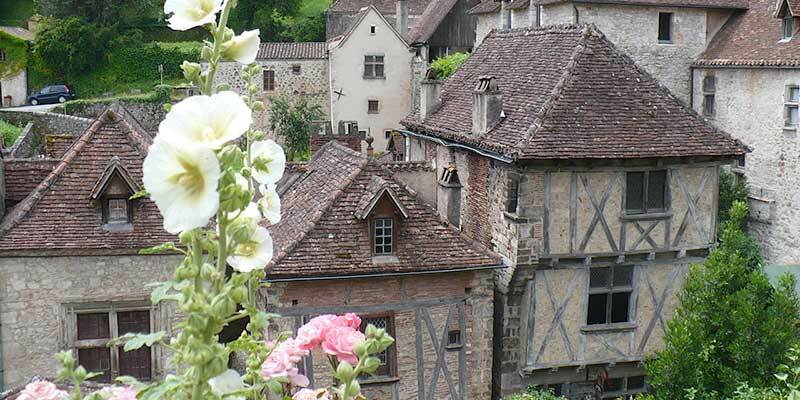 St.Cirq La Poppie is not far away, it is one of the top fifty ‘must-see’ sites in France. Shepherd’s huts known as ‘Bories’ or ‘Cazals’ built in dry stone are a testament to the old ways of peasant farming. It’s in the Midi & depends more on the Mediterranean than the Atlantic. The light is clear & high. 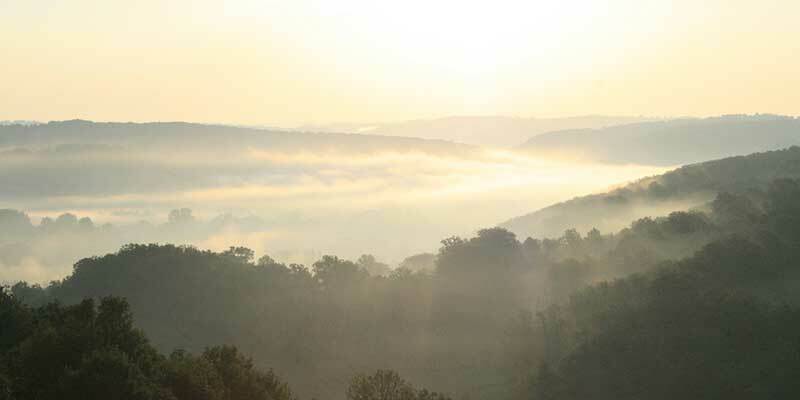 In the early mornings, a mysterious mist cloaks the valleys, making it wonderful wet on wet watercolour territory. 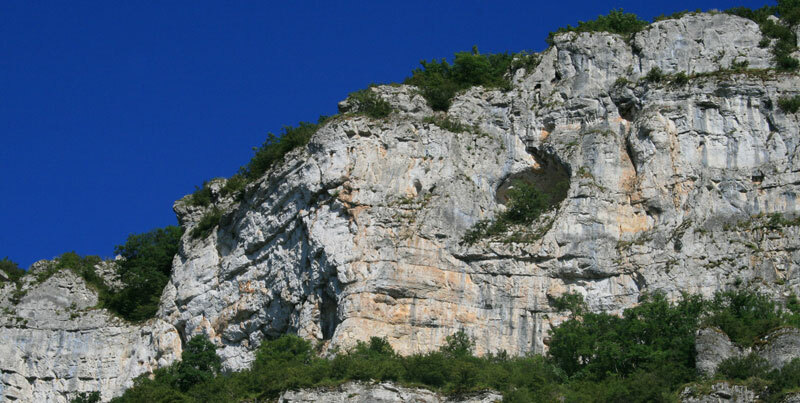 The Célé river cuts its way through huge white limestone cliffs, up to three hundred meters high in some places. Very paintable, truly inspirational, it merits the word ‘sublime’. 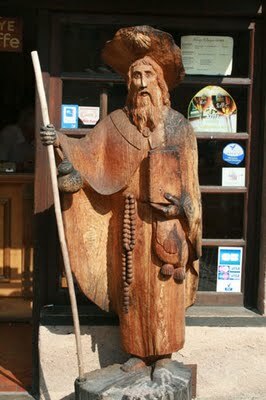 A pilgrim on the way to Santiago de Compostela. 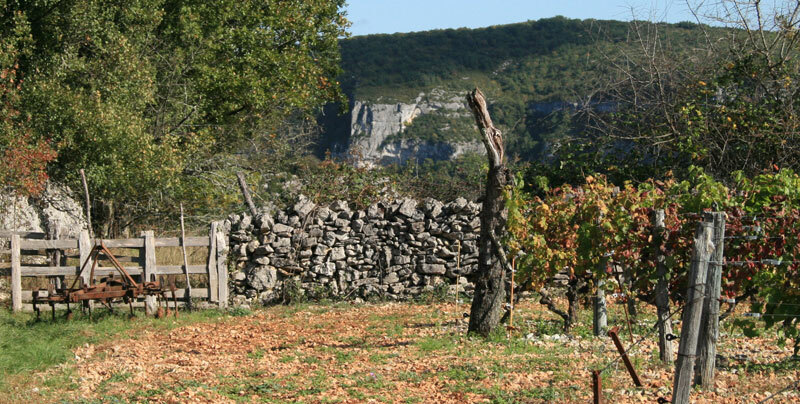 The art holiday has the optional extra of a trip down the sublime Célé valley with it’s powerful limestone cliffs. 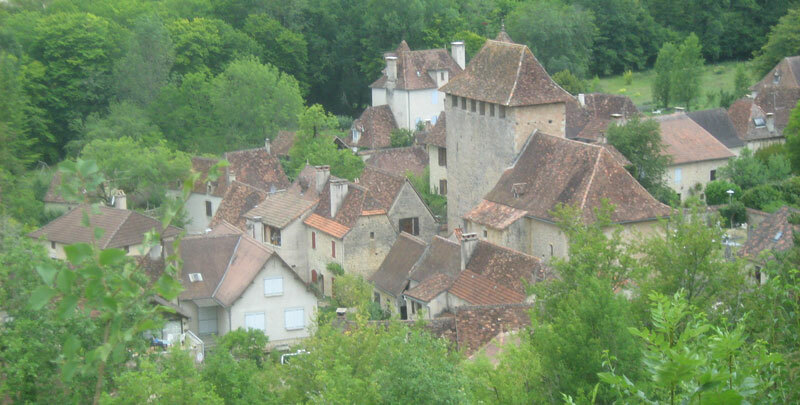 We visit Marcilhac, an authentic medieval village, somewhat ruinous but full of soul & character. The romanesque abbey was wrecked by the English during the Hundred Years War. It’s a stop on the piligrimage route to Santiago de Compostela. The Via Podiensis goes from Vézelay to Santiago de Compstela via the cathedral of Conques. It runs below Chateau de Beduer to Marcilhac. Adam was artist in residence in Marcilhac & used to live near Chateau de Beduer, painting the landscape. So he knows the area well & thus can guide you. Here, below high white cliffs, besides the river, you will paint & holiday with inspiration. 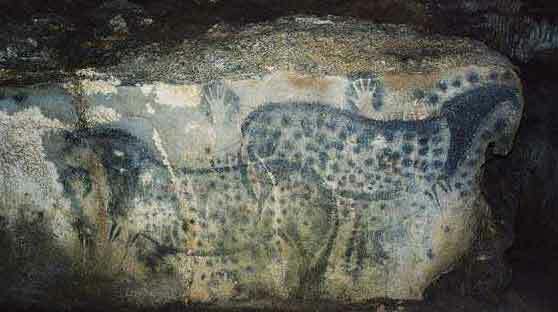 The Horse Frieze’ – Pech-Merle . Artist (or artists) Unknown.Carbon dating puts this frieze to be 25 000 years before present. 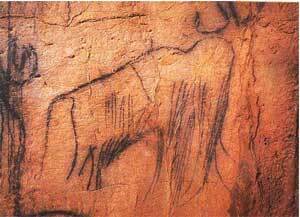 Observe on the right side horse, how the head of the drawing fits into the ‘found’ shape of the cave wall, which is like the silhouette of a horse’s head itself. Your art holiday has the optional extra of a day out to visit to the Cave of Pech-Merle, probably the finest prehistoric painted cave still open to the public. Dating from about 30 000 years before present, this is one of the high points of mankind’s creativity. To experience this is very humbling & moving for a contemporary artist, an unforgettable pilgrimage to our artistic beginings. Adam also gives an informal presentation on prehistoric art. A Hairy Mammoth – Pech-Merle’ Artist (or artists) unknown. This is not the work of an untrained hand. Observe how the contour line of the backbone ridge is drawn without hesitation. This drawing was done from memory (no mammoths underground ! ) & from imagination . The contour of the trunk is ‘found’ in a swelling of the cave wall; the artist must have pre-sighted this before starting to draw.